Groundnuts, more commonly known as peanuts, are a legume that can be processed into an oil. Groundnut oil is made by pressing harvested groundnuts, which are rich in fat -- containing 40 to 50 percent fat. Like other plant-based oils, groundnut oil contains no cholesterol. 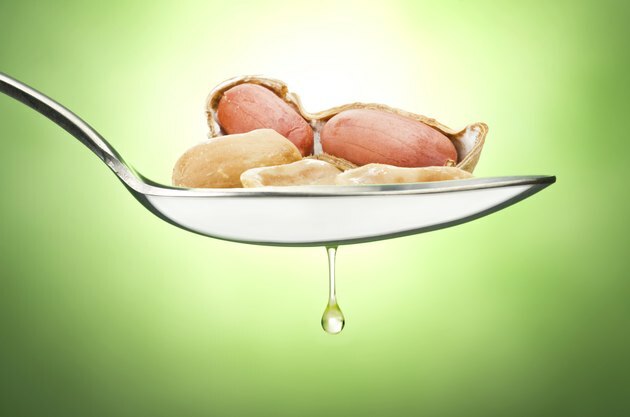 A 1-tablespoon serving of groundnut oil has 13.5 grams of total fat, the majority of which is unsaturated fat. The American Heart Association recommends getting the majority of your fat from unsaturated fats. Replacing saturated and trans fats with unsaturated fats can reduce your risk of heart disease; monounsaturated fats help lower bad cholesterol levels. Groundnut oil contains 6.2 grams of monounsaturated fats per tablespoon, 46 percent of the total fat content, and 4.3 grams of polyunsaturated fats, 32 percent of the total fat content. Your body naturally produces as much cholesterol as you need, so dietary cholesterol is not required, and groundnut oil provides no cholesterol. A diet high in cholesterol can increase the amount of plaque that builds up in your arteries, increasing your chances of developing atherosclerosis, commonly known as hardened arteries. Groundnut oil is a natural source of phytochemicals, antioxidants that protect your body from damage from toxins and free radicals. A 2014 issue of “Critical Reviews in Food Science and Nutrition" included a review that found that groundnut oil, because of its high antioxidant content, reduced inflammation in those who regularly included it in their diet. Groundnut oil is also a good source of vitamin E, a natural antioxidant. Groundnut oil has a slightly nutty flavor and natural richness, adding depth to many cooked dishes. It can be used in most dishes where the nutty taste is either masked or welcomed -- such as in spicy dishes or french fries. Groundnut oil is well-suited to high-heat cooking methods and is commonly used for stir-fries. Unrefined groundnut oil, also sometimes called gourmet groundnut oil, is more aromatic than refined groundnut oil. If you have a peanut allergy, you should avoid groundnut oil.